Once the green roof bug bites you it may be hard to hold back and get into planning the details. 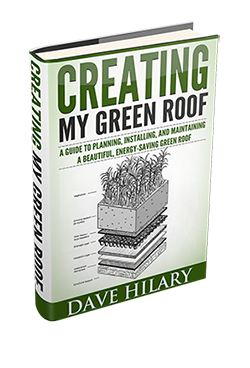 It is a sad fact that plans are often skipped in the interest of “getting it done.” Unfortunately, a green roof left unplanned is a recipe for disaster and it will cost you much more time and treasure in the long run. Green roofs are not simple to construct and they lend themselves to other features that can increase their value. By taking the time to do thorough planning you can be sure you’ll get the most from your efforts and will have a roof that will stand the test of time. A green roof can become the cornerstone for an entire range of green efforts. Since it will catch and use rainwater, and then discharge the excess, it is only natural to consider incorporating some storm water management improvements for your site. Green roofs also help to lower roof temperatures and that makes them more hospitable for solar electric panels. If your roof’s structure is robust enough then you might even want to include spaces for recreation and relaxation. Spend some up-front time dreaming so you don’t overlook important features you’d like to include. Green roofs add anywhere from 20 to 150 pounds per square foot of loading to your roof’s structure. For new construction you have to plan for the load and build the roof to handle it. For retrofits you need to consult an expert like a structural engineer to find out if the roof can support the load, and if not, what reinforcement it needs so it will. Just knowing the requirements however, is only half the job. The retrofit still has to be done, and done correctly so you need to be sure you know a job done right, compared to one done wrong. Regardless of the type of green roof they all need some maintenance. There has to be a way for people to get on the roof, and there also needs to be walking surfaces so they can move about and attend to maintenance jobs. Consider also the potential dangers for someone who has to go on the roof. Roofs with steep pitches may require some type of railing that will stop a person from sliding any further than the edge. Different types of plants require different amounts of water so care has to be taken to make sure there is adequate water retained in the planting medium, and the drainage layer. Too much water can lead to pooling and saturation of the plant roots. If water drains away too quickly then the plants may not get the water they need. Fast drainage may also carry away planting medium. Using the right system for your climate area will reduce these potential problems. The direction the roof faces, where it gets most of its sun and how much it is shaded are highly important considerations in the planning stages. A green roof on the steeply-sloped north side of a gable roof needs to have plants that do well with little direct sunlight. Plants low on the roof may not get any sunlight at all while being shaded by those above. Your climate and winds are other important considerations. Take the time to plan so your green roof has the best odds of survival, and a long life.